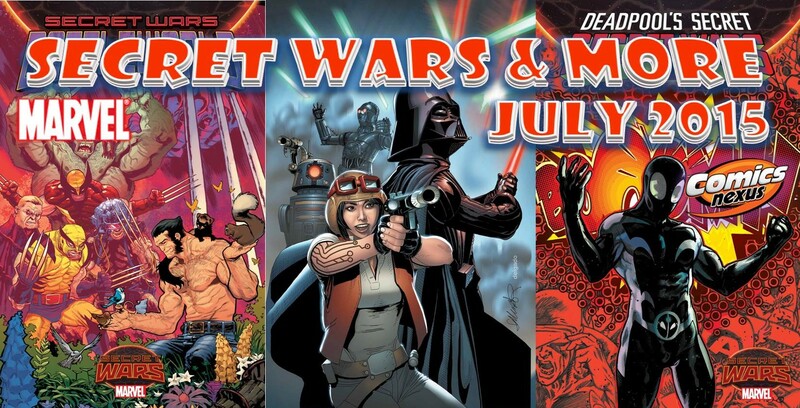 Secret Wars 2015 & More Roundtable: Marvel Comics July 2015 Solicitations Pick Over With Avengers, X-Men, Spider-Man, Star Wars & More Spoilers! The Comics Nexus and InsidePulse team weigh in on Marvel Comics’ Secret Wars and More July 2015 comic book solicitations. I’m reading ALL the SECRET WARS books. Od’s Blood!!! Plus, I’ll include my regular reads at the bottom of this list. The series keep pouring out! Never read the original event but I got the gist of it. This will be on many readers’ radar considering a movie featuring this Big Bad Boy comes out next year. The conclusion to Gerry Conway’s gang war tale. I found the first part to be lacklustre, but part two definitely delivered, and I look forward to the rest. As I’ve stated numerous times, I’ll always be by Spidey’s side no matter what! You’ve come a long way, Scott Lang. Annuals usually signify the official summer season is in full swing. It goes without saying that this is an extra treat for all Ant-fans. Al Ewing has written a quirky and unconventional but endearing incarnation of Earth’s Mightiest Heroes. Given his British nationality, why not spotlight a different team on the other side of the pond? Right vs. Might all over again. The kicker is that Marvel’s Everyman (Spidey) is caught smack dab in the middle! Scratch that!! There is no middle. Pick a side and make sure it’s the right one! This terrorist group has been making massive waves in all Marvel media. The buck doesn’t stop here since there’s a world in which they reign supreme. The prominence and continual ascendance of this organization is extremely apparent. The antithesis of every ideal the U.S. has imbued. This crimson cad is the epitome of evil, so much so that other villains have banded together to eliminate him! Molecule Man is poised to die? Maybe! It’s good to see Hickman shine a light on this background character, elevating his status to more than Doom’s aide. This smells similar to the Distinguished Competition’s guidebook. For all you encyclopædists, this tome is a must-have!! Abigail Brand, director of S.W.O.R.D. is on the frontlines. A hodge-podge of characters join in her against Doom. It’s wicked that the original S.H.I.E.L.D. (with Leo da Vinci) is on deck to help. Spider Queen! Spider-Girl! Spider-Family!! Oh yeah, Spidey is in this too. Spiders, spiders, everywhere with many a web to weave!! New creative team usually equals new direction. Simone Bianchi guest-illustrates a one-shot of Ben Kenobi in #7. Stuart Immonen grabs the reins of #8. Jason Aaron gets to crack his knuckles on this mega-money-making medium. Strap in for a wild ride! The insanity doesn’t end!! This sci-fi franchise is so flaming hot that it’ll never burn out!! The charmer from Cloud City will tell us his tricks of the trade. The early days are the more interesting ones! Secret Wars is making it very easy for me to trim my Marvel shopping for a few months. Many of the nostalgia-event books just don’t interest me that much, and I really feel that none of the tie-in books will be very essential to the main story, because that’s just not how Jonathan Hickman works. Siege #1 & 2 – If there’s any Battleworld book that I’ll buy, it’s going to be one written by Kieron Gillen and featuring characters like Abigail Brand, Ms. America Chavez, and Kang. Gillen has consistently taken the stupidest of editorial ideas (Fear Itself, Angela) and spun them into gold. I hate Marvel for double-shipping this. Star Wars: Lando #1&2 – Who doesn’t love Lando? And Charles Soule can basically do no wrong of late. Star Wars #7&8 – Too much double-shipping Marvel! Ant-Man Annual #1 – Are we to assume that Nick Spencer and Ramon Rosasnas’s Ant-Man monthly is dead in the water, and that they’re finishing the series off with this annual? It’s been fun, so that’s too bad. Hail Hydra #1 & 2 – I’ve liked Rick Remender’s recent work on All-New Captain America, and like the grown-up Ian as Nomad, but am not sure if this book directly ties in to Cap’s title, and in this case, the double-shipping works against it. Captain Britain and the Mighty Defenders #1 – A two-parter by Al Ewing and Alan Davis should draw me in, but this feels too Elseworlds for me to be really interested. Old Man Logan #3 – I have no interest in this character, didn’t really like the first OML story, and have gotten very tired of Brian Michael Bendis, but this is drawn by Andrea Sorrentino, who could make it terrific. Maybe I’m not the typical Marvel reader at all, but I just can’t get excited about Secret Wars. All of these tie-in books exhaust me just to think about. I don’t even think I want to read most of them after they make their way to the dollar bins. I’m curious to see how retailers plan on managing this thing. James, SW has 55 tie-in books (mini-series / one-shots). 55!! So, my picks? I thought the main Secret Wars mini-series was shipping 2 issues monthly? I’ll still pick up Secret Wars #5 to see how Marvel handles its multiverse creatively. Squadron Sinister #2 – This looks to be Marvel’s new Squadron Supreme post Secret Wars are true. A great writer (CW Arrow’s Marc Guggenheim) and great artist (Carlos Pacheco)? I have high hopes for this mini-series. Very small Marvel month for me. I’ll start off by saying that I’m not a huge Marvel reader, but admittedly the movies from the last few years have me picking up more. Ms. Marvel #17 – Captain and Ms. Marvel team-up! I started reading Captain Marvel because I’m a Kelly Sue DeConnick fan, and I’ve been reading Ms. Marvel since it started, so this just seems like a natural pick for me. Might be a good place for new readers to start too. Black Widow #20 – This has been a really cool series, especially the art. A must for anyone who likes her in the movies. Giant-Size Little Marvel: AVX #2 – I like Skottie Young, especially his variant covers and when he recreates characters as kids, so this looks like a fun one. Star Wars: Lando #1-2 – I’ve been liking so far where the Star Wars books have been going, and everyone loves Lando so I’ll definitely be getting this one. Groot #2 – I’m interested in seeing #1, I’d like to know how a book works with a main character who only says three words. I’ve read completely “silent” books before, but maybe this will be a theme through the entire series. I’m also looking forward to Howard The Duck #5 and The Unbeatable Squirrel Girl #7.